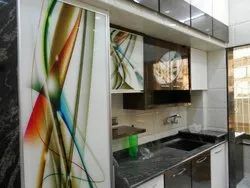 We are a leading Manufacturer of kitchen glass from Mumbai, India. The contemporary kitchen is the design style for a glass sheet backsplash. Without grout joints, a sheet of glass is as visually clean as you can get. You can run the glass full height, half height, or even as just a 6" splash. There are some size limitations, so on large walls, there may need to be a seam or two where large pieces come together. Looking for Printed glass ?